New venture. I have been working on a new website for the past four months. Picture: Erin Chapman. Recently some of our readers have asked me why there haven’t been many articles on Vamped lately. There was a good reason for the quiet spell. The site was officially launched on June 29, 2017. Anthony and I wanted to create an online vampire community buy and sell for vampire fans, where sellers can come together and post vampire related items, in a centralized location. The site will help sellers create brand awareness for products, increase traffic to seller’s own sites while increasing their sales. We offer seventeen categories for advertisements including: antiques and collectibles, apps and games, art and photography, books, clothing and shoes, electronics, entertainment, events and tickets, food and beverage, health and beauty, home and garden, jewelry and accessories, jobs, party and decor, services, travel and wanted. As you can see, we aren’t just limited to shopping items. We incorporated a design that allows the user to create their own profile, which they can link to their own website, Twitter and Facebook account and LinkedIn profile. Users can also create their own biography, that tells they buyers a little about themselves and their products. The advertisement can include single or multiple photographs, which will help showcase your item. Customers can review your products as well by commenting directly on your advertisement. There is a slider across the homepage that is programmed to display posts from the site that have the highest views. This is always changing daily and a great way to get your item noticed by new and returning visitors. Each post actually shows the number of views it has received up to date. Our top featured post right now is one looking for research assistants to help obtain material relating to the Highgate Vampire case. It has been viewed 2,163 times already—and it worked! A member of our Facebook page saw it and agreed to help out. The most popular ad so far. A request for research assistance proved to be quite fruitful. Picture: Erin Chapman. Since our service is free, what we ask for in return is that you share our posts on social media when you see them. If we post your item, don’t just like the post, share it on as many pages and groups as possible to get the word out. Doing this creates more awareness for the community and helps us grow and reach more people. Originally, my plan was to launch another related site, Horror Classifieds next year, but due to demand through people contacting me via Vampire Classifieds, I went ahead with it now. I have already been approached by people wanting to sell something, that just it didn’t make the cut as it wasn’t vampire related. 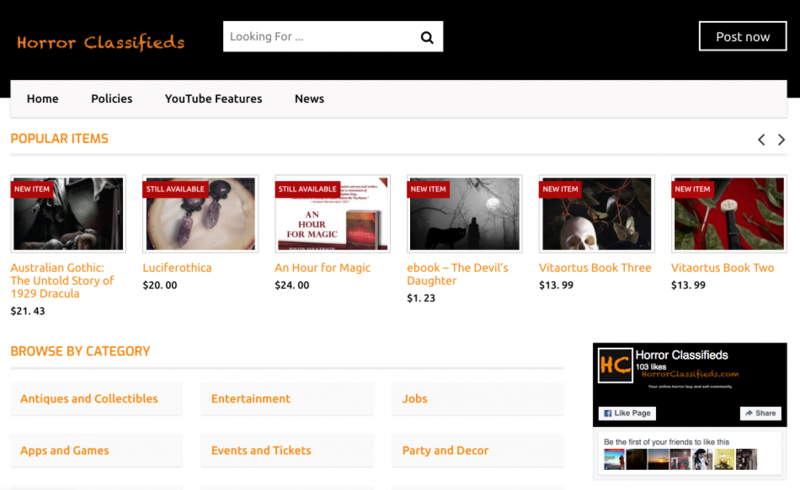 The horror genre has a wider reach and offers a platform for non-vampire related items. Make sure to check it out too! Newer venture. The other website I’ve been working on. Picture: Erin Chapman. I have a third site up my sleeve, so stay tuned for that one in the next couple of months. In the future, we will be offering contests, exclusive advertising spaces, and packages that will include social media coverage as well. Vampire Classifieds is on Twitter, and we have a Facebook page and group. We also created a YouTube channel, where I will be showcasing products either through a vlog, or sellers can send me their own videos to post. For example, if you have a book you want me to read, send me a copy and I will do a vlog about it. The possibilities are endless. officially launched on June 29, 2017: Erin Chapman, “Vampire Classifieds is Live! Move Over Amazon, eBay, Etsy, and Deviant Art! ;” blog, Vampire Classifieds, June 29, 2017, accessed August 9, 2017, http://vampireclassifieds.com/welcome-to-the-new-vampire-online-buy-and-sell-community/. archive.is link: https://archive.is/1q9OW. 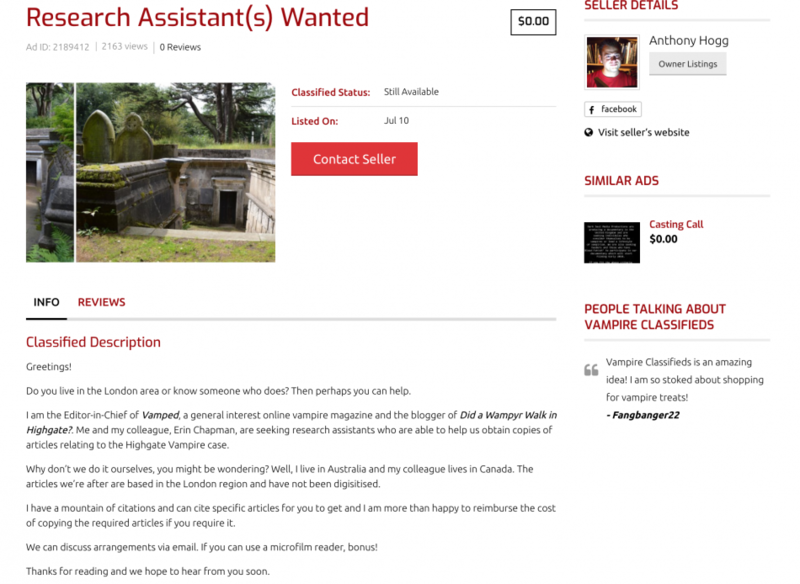 help obtain material relating to the Highgate Vampire case: Anthony Hogg, “Research Assistant(s) Wanted,” post to Vampire Classifieds, July 10, 2017, accessed August 9, 2017, http://vampireclassifieds.com/classified/research-assistants-wanted/. archive.is link: https://archive.is/1e847.